A renowned poet. An unknown policeman. Revolution vs regime, Communism vs the establishment. The arrest warrant is issued, and the chase is on. Chile’s greatest poet, Pablo Neruda, won the Nobel Prize for Literature in 1971. While the rest of the world appreciated his work – Gabriel Garcia Marquez called him “the greatest poet of the 20th century in any language” – incoming Chilean dictator Augusto Pinochet wasn’t such a fan, and Neruda was found dead shortly after he took power, said to have been poisoned on his orders. That wasn’t the first time Neruda fell foul of the Chilean authorities. 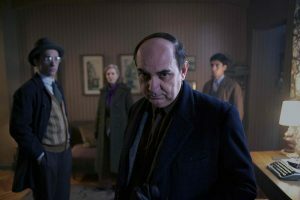 Pablo Larrain’s film tells the story, mixing fact with fantasy, of his successful escape from Chile to Paris in 1948, after a previous President banned Communism and issued a warrant for Neruda’s arrest. The film opens in Santiago in 1948, with the Cold War just getting underway. Neruda, a Senator for the Communist party, condemns the President for turning against the Communist party, then flees, and a manhunt begins. Asked what he’s going to do, Neruda replies “well, I’m not going to hide under the bed”. The film interweaves the stories of Neruda himself (Luis Gnecco) and the police inspector leading the manhunt, Oscar Peluchonneau (Gael Garcia Bernal) and embroiders truth with fiction as Neruda leads Peluchonneau on a merry dance across Chile, a game of cat and mouse where it’s the mouse who taunts the cat. It might be the superb acting. It might be the surrealism which runs throughout. “Am I fiction?”, Peluchonneau asks himself at one point (he wasn’t – but he probably wasn’t half as interesting as the film makes him either). It might be the poetry declaimed so many times during the film, bringing rich and poor together in admiration. It might be the gorgeous shots of Chile’s stunning landscapes as Neruda makes his escape over the mountain passes. There are many reasons why this film was nominated for so many awards at festivals across the world when it was released. Join us at the Lido Café on Bank Holiday Monday and see for yourself.